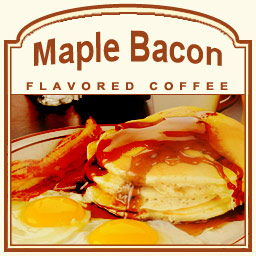 Bacon has become a foodie favorite, and now you can indulge in the smoky, yet sweet flavor of Maple Bacon flavored coffee. Wake up to the smell of bacon with a subtle maple syrup sweetness added into each and every sip of this exclusively unique flavored coffee. With only 2 calories in each cup, your taste buds can enjoy your favorite early morning flavors guilt-free. Made with 100% authentic Arabica beans, this gourmet flavored coffee features the essence of maple syrup and thick, hickory-smoked bacon, making a dreamy, breakfast-inspired creation. Roasted and shipped on the same day, this Maple Bacon flavored coffee will not only provide you with a delicious full flavor in each and every cup, but it will offer you the ultimate, fresh gourmet coffee experience. Go ahead, wake up with your favorite breakfast flavors � no cooking required!